Every group of more than 9 people must collect for check-in the security deposit of 20 EUR per person, which is fully refundable if no hostel rule is broken. We love to host! 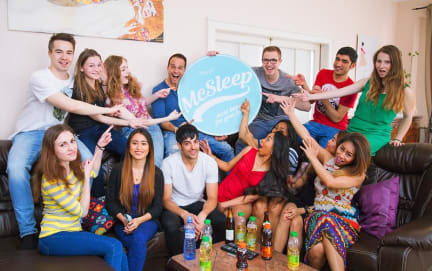 McSleep Hostel Prague is a premium family hostel where you will feel at home and easily connect with other awesome travellers. Spacious, newly reconstructed premises will make you feel comfortable, safe and just chilled. Favourite part of our hostel is definitely our amazing lounge with TV where our guests like to hang out together and have cool events with a good music and mood on. Our spacious kitchen is there for you with all the cooking amenities and free coffee and tea. Entire hostel is covered with high-speed WiFi. Our guests are just awesome. Atmosphere is very cozy and positive as we provide only 22 beds. We have 2 female dorms with own female bathroom and 2 mixed dorms. Reception is open daily from 8 am till 12 pm. Bus 119 from the Airport (“Letiště”) to metro station “Nádraží Veleslavín”. Then use green line metro station “Můstek”. On “Můstek” change the metro platform and go to yellow line platform, then use yellow line metro to station “Florenc”. Our hostel is only 4 min. walk from the metro station “Florenc”. Get off at Masarykovo nádraží and take a 5 min. walk to the hostel. The hostel is located in a vibrant part of city centre. Nightlife hotspots, great restaurants and charming riverside is just round the corner. Stay with us! We can´t wait to host you!